Woot woot! It's Friday! Only two weeks until Halloween! I've seen some mega scary nails out there for Halloween, but I'm a total scardy-cat, so I'm opting for a more fun loving kind of mani. Please keep your shredded tips to yourself. I kept it pretty simple, using only black and white. Believe it or not, this was a really easy mani. I applied two coats of base colour and then let it dry for a while. With the brush from the bottle, I used Paper Mache to make the ghosts. A few black dots for the eyes and the mouth and voila! Ghosts! I've been on another nail art supplies binge and picked up some neon studs a couple of weeks ago. There were some small neon orange circles, so I added them, followed by some rhinestones because I seriously cannot handle a mani without some sparkle. The rhinestones are hard to see with the indoor picture, but BAM, did they stand out when I went outside. Haha! 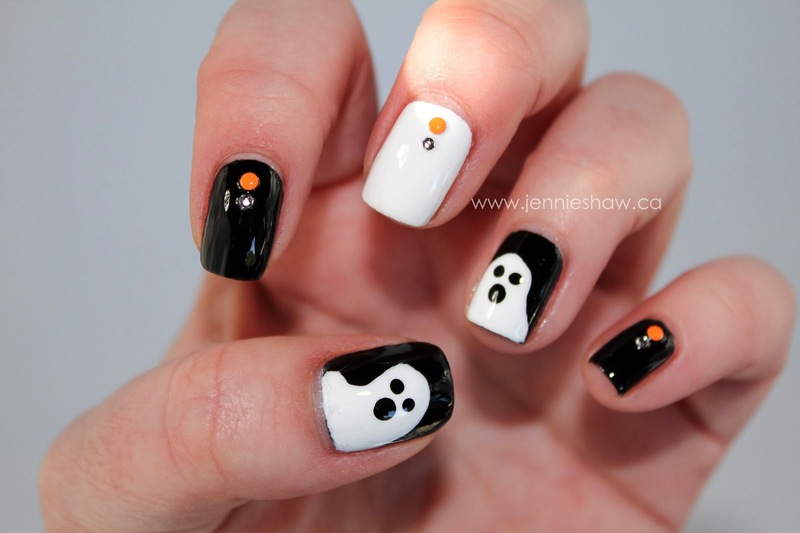 Are you rocking Halloween nails already? If so, what are you wearing? And don't forget to link up and show off. Happy weekend! The orange dot & rhinestone are THE perfect touch, honestly. 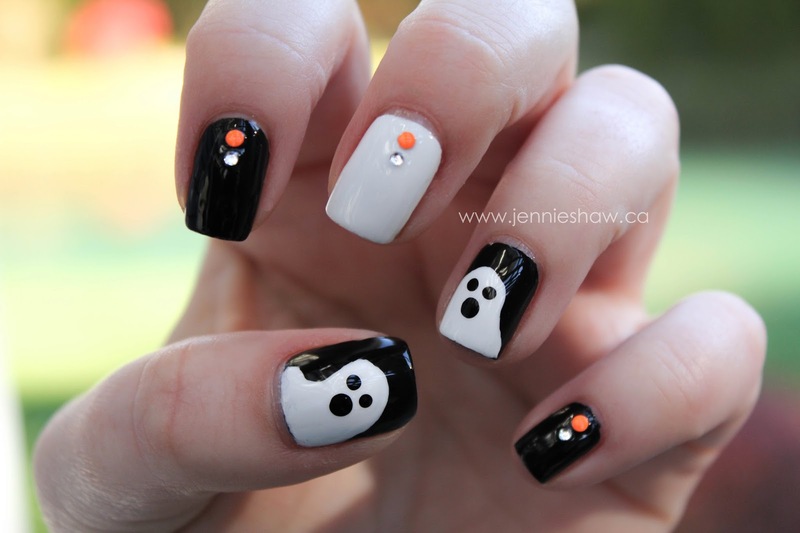 This may be my favorite Halloween mani so far! no Halloween manicure for me. Your nails always look amazing. These are SO great (and that's coming from someone who is literally the halloween version of the grinch...I hate it)! But you rock those ghosts girlfriend! I love the ghosts. So cute. I haven't decided what I am doing either for Halloween. Shredded tips??? They're not actually shredding their nails, right? just making them look that way?? Please say yes. Your nails though, supa cute! I love them! Cute designs too! Thanks for hosting the link up and enjoy your evening.